What's the difference between Cloisonné and Soft Enamel? Can I have colored letters in my personalized lapel pin and other pins? What's the most popular pin size? What's your minimum order quantity for pins and patches? How do I send you a sketch? 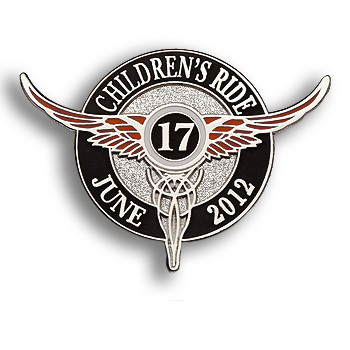 What is your refund policy for custom pin and patch designs and other products? Can you create a pin in different shapes (other than circles and rectangles)? Cloisonné and Soft Enamel process begin the same way in the die striking step. After that, in the Cloisonné process, glass based enamels are then hand filled into the recessed areas and fired at a very high temperature to create the finest emblems. The soft enamel process uses plastic based pigments which require a lower firing temperature and shorter production times, thus lowering the overall cost of Soft Enamel products. The lettering in pins may be accomplished using different techniques and each situation is different and will depend on pin size, lettering size, and the colors you want the letters / numbers to be. Raised lettering is the color of the plating with the pigment color going around the raised letters. Recessed letters are filled with any color if the lettering size is adequate for filling. Another option is to have the lettering screen printed over the metal, in which case any color may be used. If your item reflects a manufacturing, physical defect, we will either have it re-made or refund your payment if the issue is brought to our attention with 30 days of receipt. Your pins are ordered only after you approve a proof. Your approval of this proof means you are responsible for the spelling, design, colors, size, etc that is shown on the proof. All colors chosen and shown in the proof are PMS pantone colors which are industry standard. Colors reflected on your monitor or in a printout are representations of the actual colors. If you want to see accurate colors you'll need to view the colors on a PMS pantone color chart. Absolutely! We can create a design to accommodate virtually any shape imaginable. (See the pin image below to see how the shape can follow the pin design edges. The only time an extra charge is incurred is if there are "cutouts" or holes inside the design.